Jesus’ power over wind and wave – the disciples have no faith (4:40). Jesus’ power over demons – the town’s people beg Jesus to leave their neighborhood (5:17). Jesus’ power over sickness, and death – the woman is praised for her faith after the healing (5:34), Jairus is asked to have faith (5:36), but at the end the people are amazed, but there is no mention of faith (5:42). Following these powerful miracles, Jesus enters his hometown where the people “take offense” at him and he is unable to any “deeds of power” except a few healings. Jesus is amazed at their unbelief (6:1-6a). Perhaps a summary lesson is that the miracles do not produce faith, but faith sometimes has a role in the miracles. The ability to control the sea and subdue storms as a sign of divine power ( Psalms 89:9-10; 106:8-9; and Isa 51:9-10). The image of the storm as a metaphor for evil forces active in the world and especially for the tribulations of just people from which only the power of God can save ( Pss 18:16; 69:2, 14-15). When Jesus calms the storm, he speaks to the wind as though to a demon (cf. 1:24), leading some interpreters to describe this story as an exorcism. Use of exorcism language provides a cosmological context for the story. Just as the sea monster in ancient mythology represents the powers of evil, so also the raging storm here reflects all the powers of chaos and evil. Jesus’ exorcisms are evidence that he is the stronger one, able to break up Satan’s kingdom (3:23–27). Pheme Perkins  notes: “This story combines a nature miracle with the imagery of a divine epiphany. Ancient Near Eastern mythology depicted the storm god triumphing over the raging waters of the monster of chaos (e.g., Baal vs. Yam; Marduk vs. Tiamat). Even Hebrew poetry sometimes describes God as the victor in combat with the forces of chaos (cf. 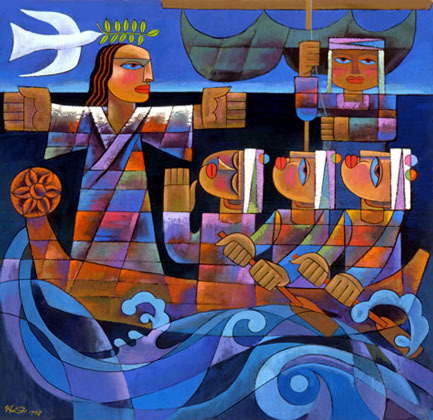 Ps 107:23–25)… The mythological and poetic imagery of God triumphing over the raging waters makes clear the response to the final question, “Who then is this …?” (v. 41). Miracles like those Jesus performed early in his ministry could have been performed by other miracle workers, exorcists, or magicians. However, no one but Jesus could still the raging storm. He is no mere human being. Jesus has God’s power to still the storm. Once again, readers know that Jesus is Son of God (1:1, 11, 24). Yet the disciples seem unable to decipher the significance of Jesus’ identity. Storms more often waken us to our need for Lord’s help than a need to wake up the Lord.